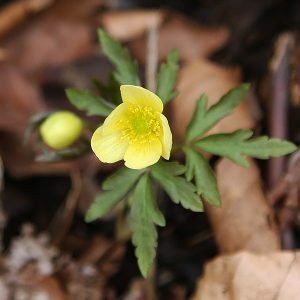 A wonderful small woodland plant, Anemone x lipsiensis with its buttery yellow flowers is one of the best Anemone hybrids. Sometimes called Pallida, it can be slow to spread, however it is worth the wait. In good conditions it will spread amongst the leaf litter and other debris from deciduous trees. It is a cross between A. ranunculoides and A. nemorosa and grows well for us in dappled shade. Flowering in early spring, the yellow flowers are bright and add colour early in the season. Foliage is green with hints of purple. Choose a position in light shade, beneath a deciduous tree works well. The soil needs to be humus rich and moist. Good drainage is also important. Top dress in winter with a little well rotted compost, some blood and bone and any leaf mold you can find. Height – Will reach around 10 cm in height. Spread – Will spread to form a clump of over time. Flowers – Cup shaped yellow flowers. Flowering period – Spring, as the weather warms a little.